A large ape, large males rival gorillas in size. The arms are distinctly longer than the legs, a male’s armspan is often over 7 feet. The face is bare and males have fibrous-tissue cheek pads, the function of which is not entirely understood. There is an inflatable throat-pouch that is especially large on males but is seldom visible except as folds of loose skin. The hair is long, coarse and somewhat sparse. Orangutans inhabit Northern Sumatra and most of lowland of Borneo, frequenting the tropical rainforest, flood-forests and peat-swamp forests. Wild – Largely frugivores (over 500 plant species identified), flowers shoots, some insects. Zoo – Monkey chow, oranges, apples, bananas, plus other fruits, vegetables and browse. The hair is red, bright orange in the young to maroon or dark chocolate in some adults. The face is dark, but young eyelids and muzzle are pinkish. Orangutans are rather shy, solitary animals. Adults travel and forage independently, each animal occupying an individual home range of several square kilometers. Home ranges do overlap considerably. Research has shown that Orangutan density varies between 1 and 5 per square kilometer, depending on habitat quality. They show almost no social interaction when meeting at a major food source. Most of the day is spent searching for food. Youngsters must learn pathways thru the forest canopy that will take them to hundreds of fruiting trees at the correct time. Their mental map, of flowering and fruiting times and places, is incredible. They are very slow and deliberate, because of their great size. Although they do not eat as much leaf material as gorillas, they do take tender shoots and leaves, and have the enlarged stomach necessary for digesting cellulose. In the wild, they have been observed making tools to reach food, to break open hard nutshells and to club snakes. Each night a new nest is built for sleeping. The feet and hands are long and narrow, in fact the palm is twice as long as the fingers. An entire adult human hand will fit on the palm of a male Orangutan. The thumbs are short to facilitate the hook-like function needed for brachiation (arm-swinging). Their feet are like hands, with an opposable “thumb” (the great toe). Orangutan hips are a ball-and-socket very similar to the shoulder and they, essentially, have four arms. They can reach in any direction with arms OR legs. They are so large, they can take no chances of a fall and must be sure of each branch hold before releasing from the previous one. Most of their way is made by swaying saplings and branches back and forth until they can reach. The sway poles in Chaffee Zoo’s exhibit are put to good use. Protruding incisors come in handy when dealing with large, tough-skinned fruits. Slightly elongate canines make it easier to grasp large fruits in the mouth, freeing the hands for brachiation. Orang-utan tooth enamel tends to be brown, but no reference as to why was found. Males are twice the size of females and their body hair is continuously growing – the only other mammals with continuously growing hair are humans and some domestic horse manes/tails. The hair enhances aggressive displays between rival males. The coarseness and length of the hair also helps to shed water. Orangutans regularly pick a large leaf to use as an umbrella. The male voice, enhanced by the inflatable throat pouch (similar to Siamangs), sounds like a loud roar, which plays an important role in male rivalry and in attracting sexually receptive females. The territorial roar is called the “Long Call.” A recent study (1981) suggests that the cheek pads may act like parabolic reflectors to locate other callers. Females become sexually mature at about 10 years and cycle regularly. During these periods of sexual receptivity, they will consort with adult males for several days at a time, even over several months, until they become pregnant. Gestation is 245 days and they live alone to bear and rear the infant. It rides on the mother and is not weaned for three years. It will sleep in her nest until she has another 3 – 3 ½ pound infant. The birth-interval is usually 6 – 8 years. Orangutan wild life-span is about 35 years and to 50 years in captivity. Chaffee Zoo’s old male, Sumac, was 42 years old at his death in 1994, the oldest known living male in captivity at the time. There was a female at another zoo that was 43 at Sumac’s death. Lifespan 35-40 years in the wild and up to 50+ in captivity. Length Male 55 inches and female 45 inches. Weight Male between 130-200 pounds and female 80-110 pounds. Diet Largely frugivores, flowers shoots, some insects. Status Critically Endangered (Sumatran) and Endangered (Bornean). Orangutans are CITES Appendix I and IUCN listed as Critically Endangered (Sumatran) and Endangered (Bornean), due to clearing for Oil Palm plantations (bio-diesel especially), logging and drought-caused forest fires. The future of the rainforest remains as uncertain as ever. On top of that, infants are also taken for the Pet Trade, and the mother must be killed to get the infant. Slow to reproduce in the first place, Orangutan populations can be decimated by this practice. 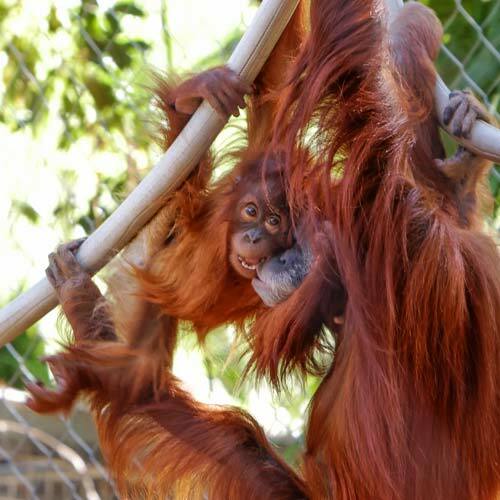 There are a number of rescue orphanages in place to rehabilitate confiscated young Orangutans. An entire adult human hand will fit on the palm of a male Orangutan.